Greece's coast guard was searching Monday for at least six people missing at sea after the dinghy they were using to enter Greece clandestinely from Turkey overturned off the coast of the eastern Aegean island of Lesbos. The coast guard said it had rescued six people and recovered the body of one man, and was searching the area for the missing. It was alerted after a fishing boat picked up one person off the island's eastern coast Monday morning, and a second managed to swim to the island. The two told authorities they had been in a boat carrying about 15 people when it overturned. 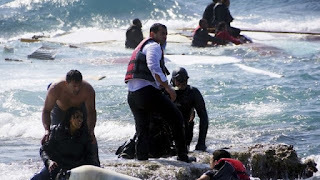 Separately, the coast guard said it had picked up 877 people in 30 search and rescue operations from Friday morning to Monday morning off the coasts of the islands of Lesbos, Chios, Samos and Kos. The figures do not include the hundreds to manage to make it to the islands themselves, mostly in inflatable dinghies. 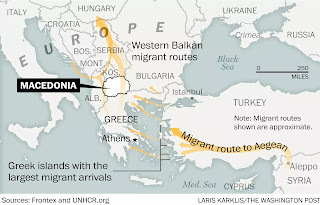 Greece has been overwhelmed by an influx of mainly refugees from Syria and Afghanistan reaching its islands from Turkey, with more than 160,000 entering the country so far this year. The vast majority, if not all, do not want to remain in Greece, a financially broken country where unemployment runs at more than 26 percent. Instead, the migrants seek to make their way north toward more prosperous European countries such as Germany, Sweden and the Netherlands. The Greek government has chartered a ferry to transport migrants and refugees from the Greek islands to the country's main port of Piraeus near Athens, as tickets on regular ferries are hard to obtain during the peak tourist and holiday season. The ferry arrived in Piraeus Monday morning with 2,500 mostly Syrian refugees transported from Lesbos. Thousands more remain on the islands.